If you’ve been following me for awhile, you’ve definitely heard about my love affair with my Air Fryer!! We received this gadget as a wedding present, and it has become one of our most-used kitchen tools! This thing is THE BEST for creating crispy, delicious veggies…and is much less time-consuming than using an oven. 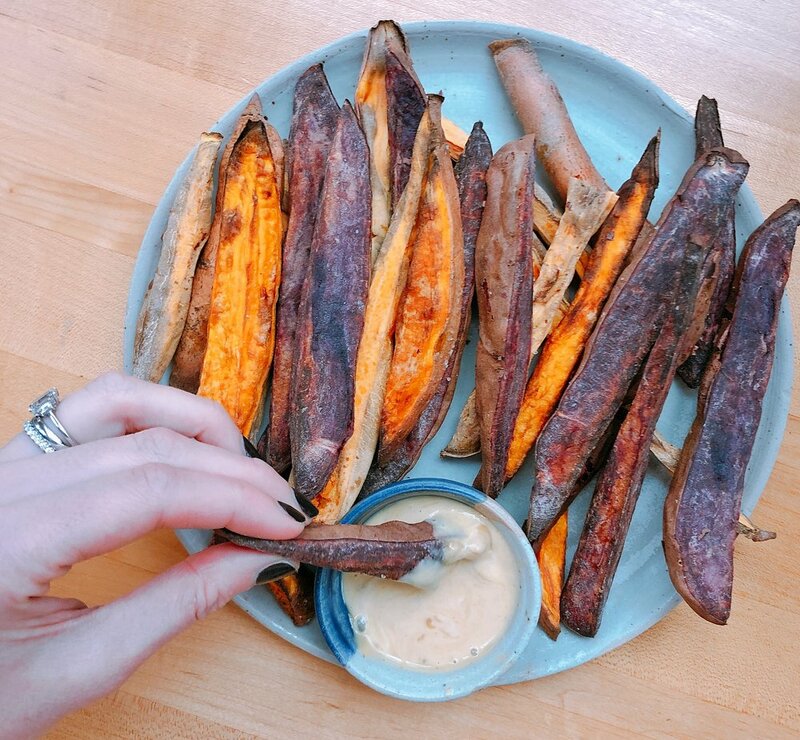 Many of you have asked for air fryer recipes, so I wanted to start with something super easy, and something we make in our house all the time: sweet potato fries! Seriously, making these with the air fryer couldn’t be more simple! All you need are sweet potatoes, cooking oil and salt! Results are foolproof and totally delicious! Enjoy! Preheat your air fryer to 375F. 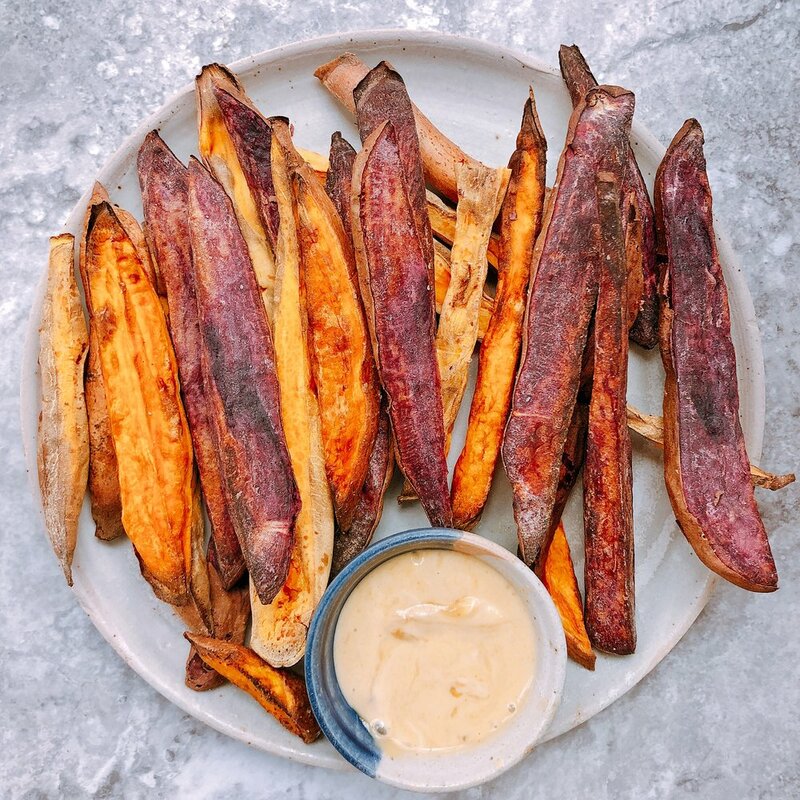 Rinse and dry sweet potato fries, slice into wedges or thick fries. I prefer them a little thicker in the air fryer because they will be crispy on the outside, but chewy and delicious on the inside! I like to leave the skin on! Once dried, add olive oil to potatoes and mix thoroughly, making sure oil is on each potato. Although adding oil isn’t necessary for these to cook, it helps make them crispy! In two batches, cook the potatoes at 375F for 15-18 minutes (depending on how crispy you like them). Serve warm. For the sauce: mix all ingredients thoroughly, until incorporated.